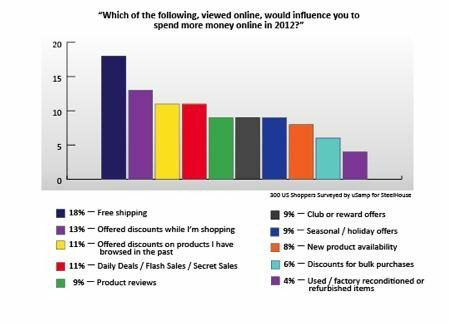 According to a recent survey commissioned by behavioral commerce experts, SteelHouse, shoppers plan to spend more money online in 2012, with electronics, clothing and household goods being the most sought-after items. Respondents were asked a series of questions about their current and future planned online shopping habits, as well as how often they used their mobile smartphone or tablet to complete purchases. Online shopping is now preferred over traditional brick-and-mortar shopping excursions, according to respondents, and electronics are at the top of their shopping lists. This year, a large percentage of people plan to spend their money on electronics (44 percent), followed by clothing (34 percent) and household goods (31 percent). Office supplies and cosmetics rounded out the bottom of the list. To the surprise of few, mobile and tablet shopping will continue to gain momentum in 2012. Close to 40 percent of respondents said they will be shopping online more this year with their smartphones, while 52 percent of tablet owners shared that they plan to shop more online as well. Furthermore, the survey revealed that there are three key catalysts that can motivate shoppers to complete their purchase. When asked, “Which of the following, viewed online, would influence you to spend more money online in 2012,” respondents chose free shipping as the main influencer, followed by real-time discounts and discounts based on past purchases. Refurbished item markdowns and discounts for bulk purchases bottomed the list. Another possible contributing factor to the expected surge in online shopping is increased optimism regarding the economy. When asked about their outlook on the 2012 economy, nearly half of all survey respondents said that they are more optimistic about the economic outlook in the coming year. “It’s encouraging to see that 60% of shoppers will spend more money online in 2012. However, The State of Online Shopping 2012 survey shows that online retailers must deliver the right offers, through the right medium, to their shoppers in order to capture a bigger share of their spending,” said Mark Douglas, President & CEO of SteelHouse, in an email to CP. Online shopping is not only changing the way consumers think, but also the way they spend. Apart from its convenience, online shopping has changed the relationship between sellers and buyers.